It looks like this week will be a big test for those preparing for the Boston Marathon. The distance: 18 miles. The terrain: some hills in the first half of the run. The weather: looking wet, possibly snowy. The good news: every step means you’re one step closer to being ready. This weeks run will start out with a trip to Breakheart in and out the Saugus side. As the half marathoners head back to Brueggers the marathoners will head towards Farm St in Wakefield, follow Montrose to 129. That will bring them to Lake Quannapowitt, where they’ll loop around to Main St and head back to Melrose. This is one of those runs where you know you’ve gone long because you’ve seen so much along the way. Water Stops: This week is a tricky one. Five water stops in four locations. I’ll need some volunteers to park their cars in the w/s spots for me, and volunteers to pick them up. I’ll drop supplies off at the cars after the run starts and join in for some of the run along the way. Let me know who can help and how and we’ll figure out the details in the next 48 hours. So who’s in this week and for what? Roll call! For training for Boston with us, this Sunday’s run will mark the halfway point. After this 14 mile run you’ll have trained for 7 weeks, with 7 weeks remaining. Enjoy this easy 14 though, the big miles are right around the corner! This week we head over to Franklin St into Stoneham, around the back side of Spot Pond and up Highland Ave to the Fellsway and around to Grimsby’s where we’ll head back up to the Pond to Friendly’s again and back Franklin. Same roads as usual but with a twist in order and direction. With some new snow on the ground this week, keep a look out for icy spots and be extra careful when forced of the sidewalks into the road. Remember Sunday morning drivers aren’t always the most diligent. For those running the shorter loop, this route is very similar to last week’s route, just changing the water stop location. It is possible to jump in at Friendly’s and get a 6.5 mile run in. Or go longer by following the full route and cutting back at Grimsby’s for about 10 miles. 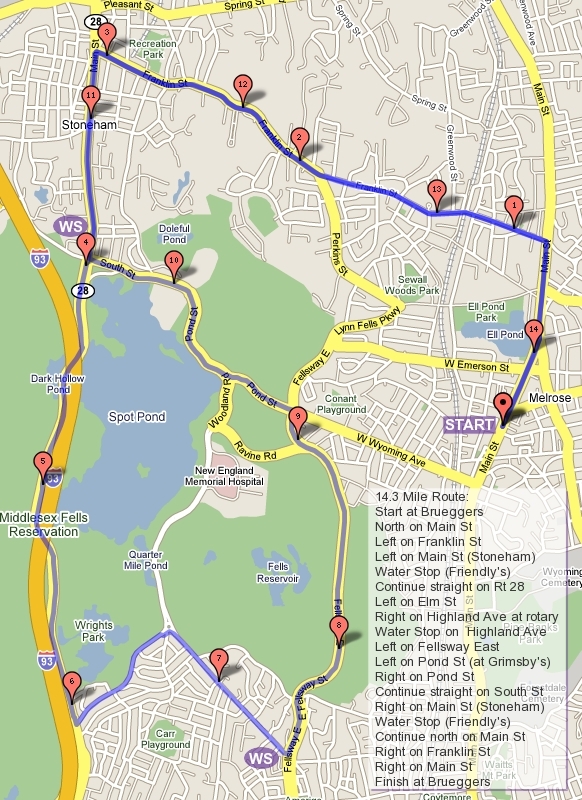 Water Stops: there are two stops, Friendly’s in Stoneham and along Highland Ave in Medford/Malden. Barry’s away this weekend so he’s out. Let me know if you’re interested in volunteering (with or without running, or starting mid run). I’ll check back later and figure out how we’ll handle the stops. So who’s in and for how much? Roll Call! Sunday is Valentine’s Day, and what better way to start it than a visit to your one true love, HILLS! This week we continue our training with the hills of Winchester Highlands. A 16 mile route takes you out over 93 to hilly Highland Ave with a side trip to Reservoir Rd in Winchester (one of the prettiest streets we train on) . Highland Ave takes us to Rt 38 in Winchester where we take a right and end up in a rotary. If you’re gonna get lost, it’ll probably be here, as you go right around the rotary you take the second road out of it. It is Main St, Rte 38 but it isn’t marked. Once your on Main St follow it to Washington St where you’ll head back to Forest St and back home. Confused? Ok, this week you’ll need a map then. Out on the course to help you this week, since I’ll be down in Martha’s Vineyard running a 20 Miler, will be Barry Petzold and Trevor O’Shea. Barry will man Water Stop 1 and 3 at Eugene St and Forest St in Winchester. Trevor will handle Water Stop 2 at the end of Highland Ave at Rt 38.Â Trevor might also be able to head over to the Flynn Rink by Spot Pond for a 4th Water Stop if necessary. Barry has his supplies, I need to drop the supplies off with someone to bring to Brueggers. I’ll have to do this Friday Morning, so if you’re running and you live close to Melrose Center, let me know if you can take the supplies. Thanks! Ok, Who’s in? Not me. Roll Call! If you missed last week, it was a lot like this week. A large group assembled early at Brueggers eagerly awaiting the start of the run.Â Despite living the furthest away Lois arrived the earliest, about a half hour early, which had more to do with Sunday Morning fuzzy math than eagerness. Behind her roughly 25 runners prepared themselves for another frigid run. Although a week had gone by the temperature was still frozen at 15 degrees for the start of our run and a stubborn wind once again brought the wind chill down to 0 degrees. That didn’t stop a few new runners from joining us (and since I don’t remember all their names I won’t name any of them, give me a few weeks) for what proved to be a challenging run. The route, just like last week, started north on Main St, right towards one of the coldest spots in downtown Melrose: Ell Pond. the wind whipped across the pond and through our outer shells sending a shiver up each runner’s spine.Â Heading north would be cold. Luckily we quickly turned east on the LynnFells Parkway and the lack of wind and bright sunshine made the cold morning more manageable… for a little while. Turning onto Main St in Saugus and heading towards Farm St gusts of wind reminded us that it was really cold. Struggling to get muscles warmed, a slow shuffle through some hills brought us to Water Stop 1 where BarryP poured the beverages and served up Gu and mini candy bars to everyone. When I reached the stop Barry and Lauren stood out, their vacation tans seeming very out of place next to Wayne, Ginny, Molly, Rachelle and I whose paleness was shaded only with some red from the harsh wind. That group took off quickly from the stop, and Carol came and went before I got my act together and headed for Breakheart. I had suggested back at Brueggers that runners go left in Breakheart so they could estimate the iceness of the flatter side of the reservation before tackling the hills. The hills of Breakheart are challenging enough without ice so I wanted each runner to decide for themselves if they wanted to be daring. Along the flat side I hit one patch of ice which seemed easy to run through. That and a report from Barry and Wayne, who hit the hills first, telling me the path wasn’t too bad the rest of the way convinced me to forge ahead. With my attention on the footing as well as the music from my headphones I just barely caught a glimpse of something flying towards me from right. I flinched and quickly turned to see what had come close to my head, a large hawk swooping past the path. Dressed in all black from head to toe, and a running posture that some have likened to a squirrel eating a nut, I may have actually been mistaken as a giant squirrel, and as the hawk approached he realized I was a little too big to carry off.Â I guess I’ll go back to my green jacket and start holding my hands lower. Having survived the hawk flyby, it was now time to test my luck on the hills. A long slow climb up hill number 1 seemed awkward and slow, not having run the loop in this direction in a long time the lay of the land seemed very unfamiliar. Hoping from clear track over ice to the next clear track I made my way though hill 2 and found Walt coming the other way. Walt, who missed the Brueggers announcements while off running his warm up miles, commented that I was going the wrong way. I was not the first he mentioned this to, but at some after me I’m sure he realized that it was he who was going the wrong way. With the cover of trees shielding the wind the section through hills 3 through 5 felt warm, working up a good sweat, a sweat I would regret heading into the wind back to the water stop. Back at the water stop Molly and Ginny were off as I pulled in. BarryC and Lauren were soon off on their way to add on a side trip to Lake Quannapowitt to stretch their run to 18 miles. Carol started out right behind them and after Rachelle finished enjoying a gingerbread Gu she trotted off behind Carol. After I choked down a cold thick vanilla Gu I set off behind them with Walt on my tail. The coldest part of the run was upon us, Water St, heading into a strong wind from Wakefield Center that never stopped. I kept the pace up, with some uptempo music helping me fend off Walt’s approach, while keeping myself from burning out by making sure not to catch Carol and Rachelle. Perhaps I was mistaken and Walt wasn’t right behind me, or he was off improvising his own route which is not uncommon, but he never did catch me. I gained on Carol and Rachelle as the three of us made our way down Main St and back to Melrose. The cold wind was now pushing us from behind, strong enough to feel coldness against our backs. Through Greenwood I must have run past an orange spongy Calloway golf ball and a five dollar bill, two mementos Sue found from her last training run before the Martha’s Vineyard 20 Miler. I told her I would figure out some connection between her treasures and the race, and I have… I believe at one point in the race we will be running by a golf course that American Presidents have played while on vacation. Back to the run… resisting the temptation to catch them I tried to match their pace towards Franklin St. Rachelle crossed with the traffic light in her favor. Carol got stopped by the cross traffic and wandered along the sidewalk for the extra distance and the extra heat. I turned left on Green and hooked up with the MRC summer route for some extra miles. I headed up Porter Street and down Upham St, back into the head wind from the West. Thinking that Rachelle and Carol were already back at Brueggers warming up, I turned up Lebanon and regained the assistance of the wind. It pushed me to Sylvan St, where it work against me again as I made my way to the blustery Pine Banks and fought my way through the cold gusts back to Brueggers. And that was this morning’s cold, exhausting training run. Very similar to last week… except this is the last training run for the Martha’s Vineyard 20 Miler where many Sunday Runners will find themselves next week. Wish us luck!!! Week 5 -Breakheart it is! Last I checked, as everything south of us gets slammed with 2 feet of snow, the high pressure that’s keeping it cold here will mean we have only flurries in our future. For the first time this year this cold has been a good thing! So what does this all mean, it means (unless I hear its icy there) that the long runners are headed to Breakheart for the first time this season. Something some people are looking forward to while others are dreading. The shorter distance runners can do one of two things, run the posted 6 mile route, which turns off the main route pretty early and unless I get an extra volunteer won’t have a waterstop, or do what many do and carpool from Brueggers over to J Pace’s in Saugus where we turn off the LynnFells Pkwy. If you join in there and run Breakheart with us you’ll run about 7 miles and get 2 water stops! Speaking of water stops, I believe Barry is available to help and if that’s true, that’s all I need. Cold weather. If anyone has any tips for the less experienced long runners, post them here. There is a link under the weather outlook on Sunday Long Run main page “What to Wear” that lets you plan your running clothes based on the weather conditions you input. Basically dress in layers, you’ll get hot and cold at different times throughout the run. Some will be testing out their racing skills at the Great Stew Chase tomorrow, but let’s see who’s planning on running with us tomorrow. ROLL CALL! Who’s in!